Morning of the Mo is a grass roots event with all entrants required to sport a Mo, ride a pre 1980s surfboard and rock an outfit relevant to the 70s. Alter egos are encouraged. All proceeds of the event are donated to Movember and invested in programs focused on prostate cancer, testicular cancer, and men’s mental health. This year we'll be heading back to the Byron - Ballina coast for another weekend of old school fun and games, a snag in bread and even a wave. 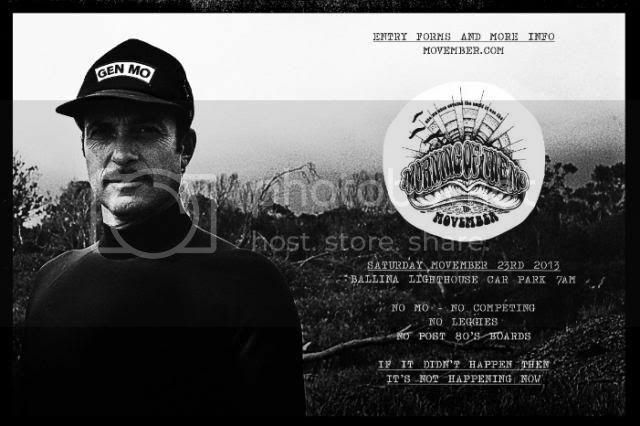 The surf event will take place in the morning, followed by a Mo Party at an iconic Byron venue. Date: Saturday 23rd November Time: 7:00am Where: Meet at Ballina Lighthouse Car Park.